The Large Longwave Station G3L has been developed by Telefunken GmbH in Berlin in the year 1932, six stations have been acquired for service in the Swiss Army. The G3L was the first station to implement Hell mode, a facsimile mode transmitting characters in a 7x7 dot matrix. The "Hellschreiber" had been developed by Ing. Rudolf Hell. In contrast to shortwaves, propagation conditions on longwaves are very stable and predictible, so Hell mode turned out be quite reliable and was in use over many years. three phase generator (380 V, 50 Hz) driven by fuel operated motor. 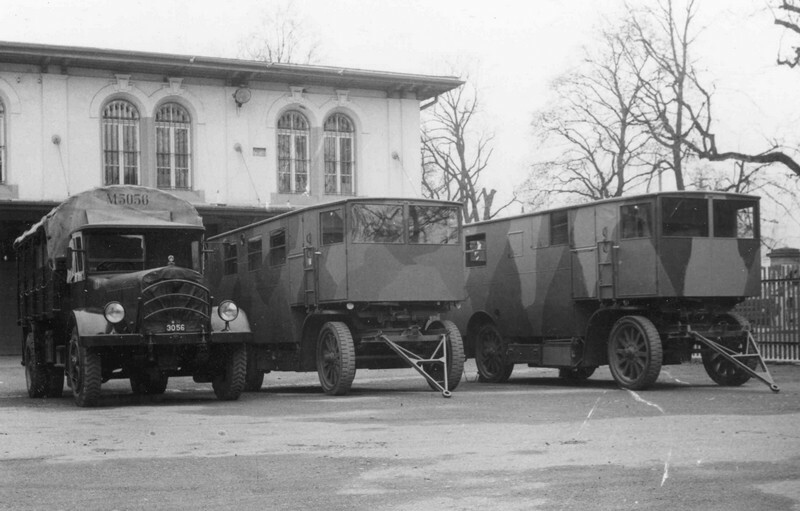 The Large Longwave Station G3L has been developed by Telefunken GmbH, Berlin, in around 1932; six stations have been acquired by the Signal Troops and came into service in 1934/36. The station got	the designation G3L (Gross / Large - 3 Kilowatts - L / Longwave) and was used for communications between parts of the Army. The three stage Telefunken transmitter Spez 914Bs can be tuned in four ranges from 100 - 600 kHz with variometers, all tuned circuits are synchroneous, variometers are also used for antenna tuning. In the transmitter twenty valves are used: in the driver stage a RS329g, in the intermediate stage one RS329g, in the output stage four RS329g, the output valves are grid modulated. The transmitter output power ist 3000 Watts CW and 1000 Watts in modulated telegraphy, telephony and Hell mode. The receiver used is the Telefunken longwave receiver E31 / Spez 470 Bs, a TRF receiver with three tuned circuits covering 100 - 1091 kHz in four ranges, in this receiver, six valves RE074 neutro are used. 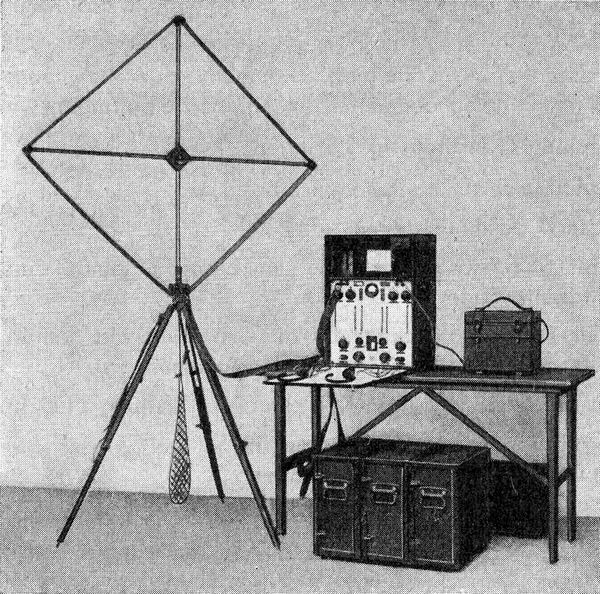 Later, the Autophon E39 All Wave Receiver with plug in coil sets was used as station receiver. The station G3L is intended for mobile operation, it consists of a truck with the generator onboard (1500 kg), the "transmitter trailer" with the longwave transmitter (6000 kg) and the operators trailer with the reception and Hell printer equipment. One G3L station was used as fixed installation in the "Funkerhaus" (Signal's House) at Berne, it was the fixed station used by the Army command. This transmitter has been used for scheduled morse code training transmissions for many years. The standard antenna for the G3L / SE-303 is a three wire T / L antenna with a length of 80 meters between two pluggable 22 m masts, the complete staton needed some 40 x 100 m of space, same dimensions like a standard football ground. 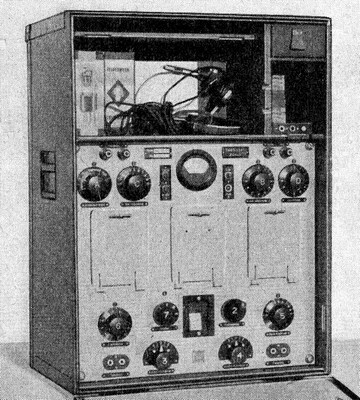 The G3L / SE-303 has been withdrawn in 1961 and liquidated shortly after, it was replaced by the SE-415 radioteletype station for communications between army corps.